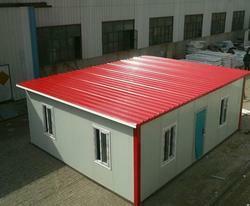 Pioneers in the industry, we offer puff panel roof and puff panel wall from India. Owing to our experience in this industry, we are engaged in manufacturing and supplying a wide range of Roof PUF Panel. These are widely used for the purpose of roofing in different areas. Our panels are the high-tech machines that are used for various purposes. Our offered products manufactured using high quality polyurethane foam and are widely used in the industries and households. These roofing panels are available at most reasonable prices. Backed by our highly skilled and experienced professionals we are engaged in offering our clients with an exclusive range of Puff Panel Wall. Our offered products are tested on our various parameters in order to ensure the quality, strength and durability of the product. Our offered products are light weight and have distinct uses in Industries and households. We identify the actual needs of the customers and then provide the solutions. Clients can easily avail these products at affordable prices. Looking for PUFF Panel ?